Your app menu is very important, it tells the app what pages to display. If a page is not in your menu, it is not accessible in your app. The first menu item becomes the homepage of your app. The menu you are using for your app is found under the Settings tab. First check this setting to see what menu your app is using. To add/edit a menu, go the Menus in the App Customizer. Choose your menu (or add a new one). To add an item to your menu, click Add Item. Choose the type of page you want. Click "Add to menu", and then click the menu item to expand more options. Here you can choose an icon class, hide the menu item, and more. To add an external link to any website, add the full url and a page title. Add to your menu, and then click the item to expand it. 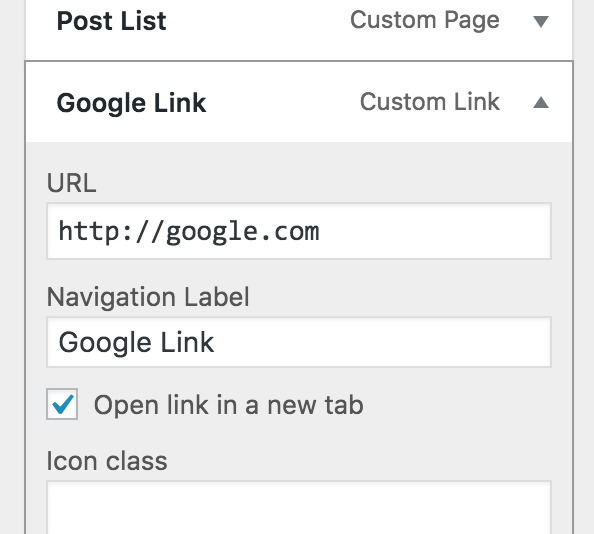 Select "Open link in new tab" and save. To use the system browser (Chrome or Safari) instead of the in app browser, add the word "system" under extra classes on your menu item. To display a custom page you created in your app ( custom HTML or list page), choose Custom Pages and click the page you want to add. After adding to the menu, click the item to expand to show more options. Here you can choose an icon class, hide the menu item, and more. Important: Custom pages will not show in the preview until you rebuild your app under the Build/Preview tab. After adding the item to your menu, click it to expand more options. Here you can add an icon class name, which will display an icon. To find icon classes, visit the Ionicons documentation. Search for an icon, and use the "Name" that comes up. To hide a menu item, add any page to your menu, then click to expand more options. Type "hide" in the extra classes field, and save. Why hide a menu item? A good example of a hidden page is an intro page. You want your app users to see the page the first time they open the app, but it doesn't need to be in the menu. You may also have subcategory pages you want to be available in your app, but you don't want to have a huge number of menu items. To hide/show menu items to logged in users, click here. Adding menu items for tabs is the same process as above. 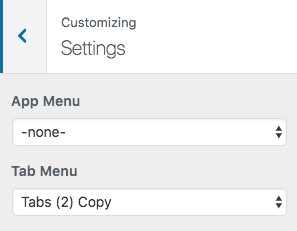 To set a tab menu, go to the settings tab and select your menu in the "Tab Menu" dropdown, and save. You may need to refresh the page to see the change in the preview. You should use a maximum of 5 - 6 links in a tab menu, or else the display will be squished on smaller devices. If you want to your tab menu to show at all times, please view this article. The starting screen of your app is set by the first menu item of your menu. One thing to be aware of is that pages from other apps in your account will show as options for other menus. Along with that, these menus will also appear as options to select in all apps on an account. This is because of how the WordPress customizer works with its menus.